Recorded as Hawick, Howick, and originally Hawic, this is a Scottish surname. 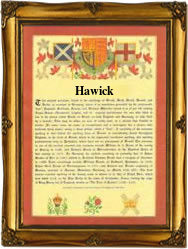 It is locational from the town of Hawick in the county of Roxburghshire, or it is possible that for a few name holders it may derive from the pre 7th century Celtic and Olde English word 'hafoc' meaning a hawk, since in fact Hawick means 'Hawk's farm'. Whether this was a farm belonging to a person called Hawk, or whether it was a place where perhaps hawks were trained or found in some numbers, is unclear. In medieval times and sometimes for centuries afterwards, it was difficult to separate the surname spelllings, and it may be that some nameholders started as the locational name, but in time crossed over, and vice versa. Over the centuries, spelling has been at the best indifferent, and local accents very thick, often leading to some strange variations of surnames. In this case John de Hawic was an early charter witness in Scotland in 1175, whilst William Hawick was the prebendary of Guthrie in te year 1234. Andrew Hawike, also at various times spelt as Havic, Hawik and Hawic, was the rector of Listoun in about 1410. Although the nameholders do not appear to have ever been granted clan status, they were of prominence. The Hawicks of Delting, in Shetland, far away in the North, being recorded over several centuries as substantial land owners.